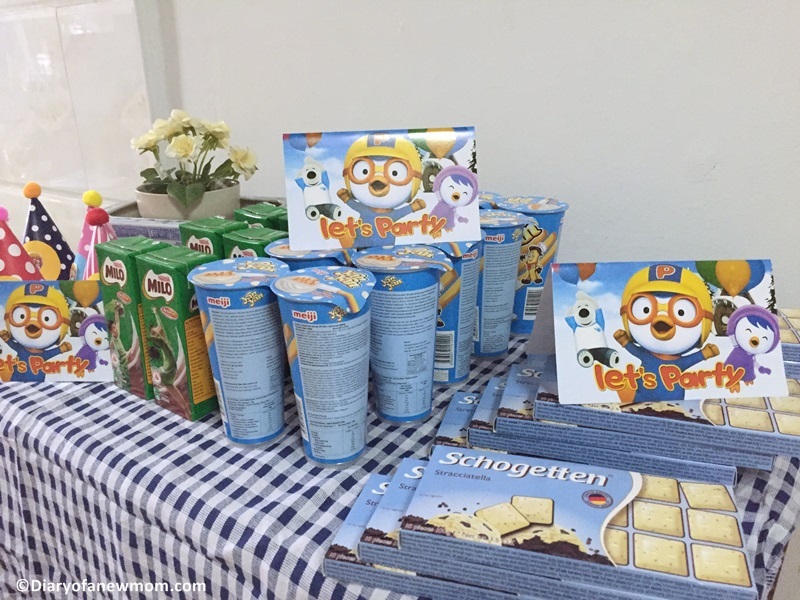 We threw a Pororo themed Birthday Party for our kid when he turned three! This is a long due post and as always I am late with some posts. Now my son is going to be 4 years old in next October. 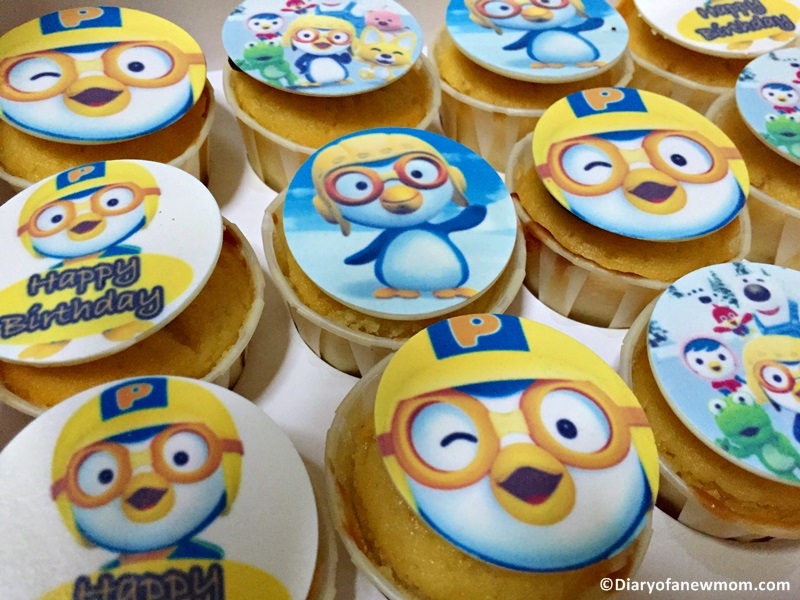 So, before he reaches 4 years old, I am rushing to share some posts related to his Pororo Birthday Party! Pororo is a cute little penguin who is the main character of Pororo and the friends cartoon series. Well, I am a mom who allows my kid to spend time with apps and tv shows under my control with limits. Other than Peppa cartoon series, I allow him to watch Pororo and the friend too as this series is suitable for his age as I think. Now, I am talking about last year which my kid was below 3 years of age. He loved Pororo and still he loves. He also loves to watch Pororo educational series which teaches about patterns, counting and other educational topics. 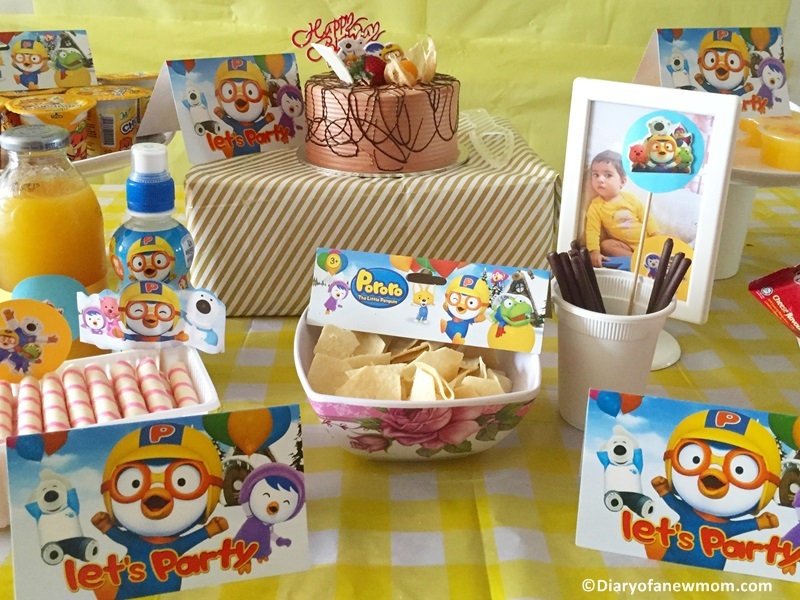 As I love to select a theme for his birthdays, last year I selected ‘Pororo’ as our 3rd Birthday party theme. Well, we didn’t have guests for our home. 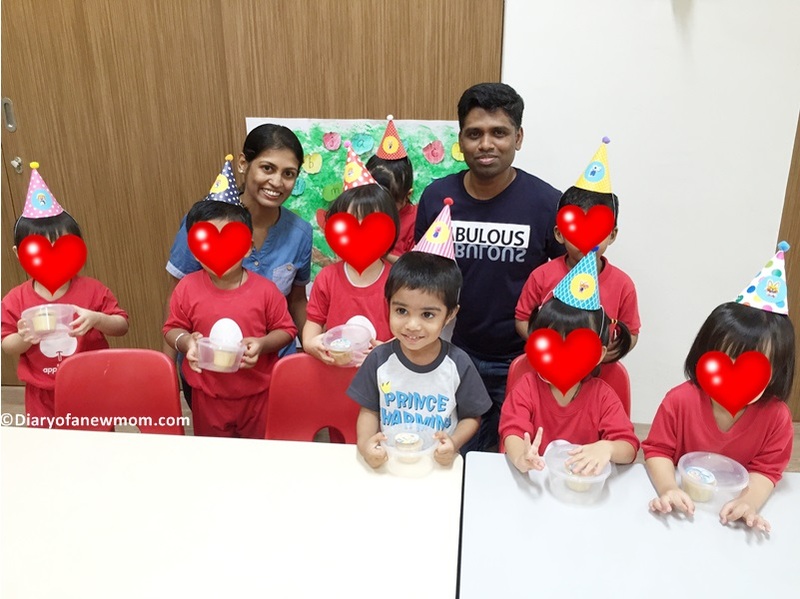 Instead we celebrated his Pororo Birthday Party at his Playgroup with his teachers and friends. It was a lovely and memorable moment. 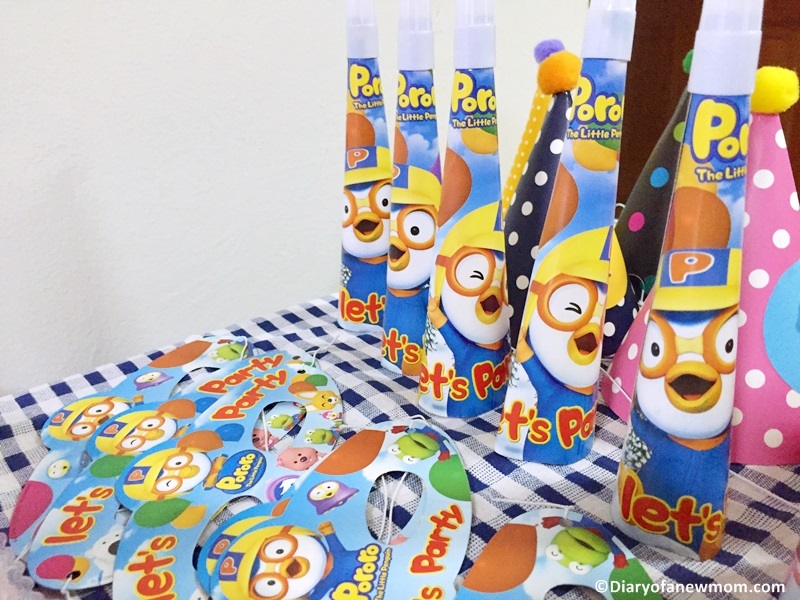 Here are some of the highlights from our 3rd Birthday celebrations with Pororo themed birthday decorations and supplies. Before everything I wanted to plan his Pororo themed birthday cake. When I checked online, I could find beautiful Pororo cake design ideas. However as we celebrated the birthday at his playgroup, I had to check with the teacher. Instead of cutting a birthday cake and serve the kids, teacher was happy to have cupcakes. I loved that idea too as cupcakes are easy to serve to the kids. However, I couldn’t find a place to buy cupcakes easily. There are cupcake shops around my neighborhood, but they have some limitations. Finally I found thecakeshop.com.sg . They were really helpful and I could place my order online. We ordered Pororo themed cupcakes. Although we bought cupcakes for celebrations at the playgroup,I also wanted to blow candles at home as a way of family bonding. So,below is my birthday cake for him. 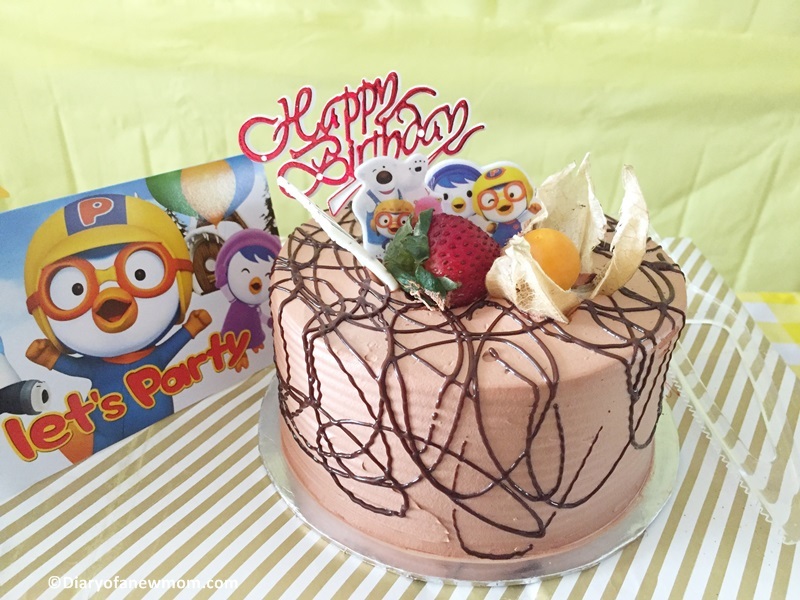 How I made this Pororo Birthday Cake? It is really simple. I bought a plain yet simply decorated cake from nearby bakery shop. The cake came with a ‘Happy Birthday’ topper. To the same cake, I created a cake topper using a sticker with Pororo and friends. I pasted that sticker on a toothpick creating a beautiful and easy cake topper. 🙂 Finally, here is our very own Pororo Birthday Cake! I couldn’t find Pororo themed party hats. Instead I bought a pack of DIY party hats. 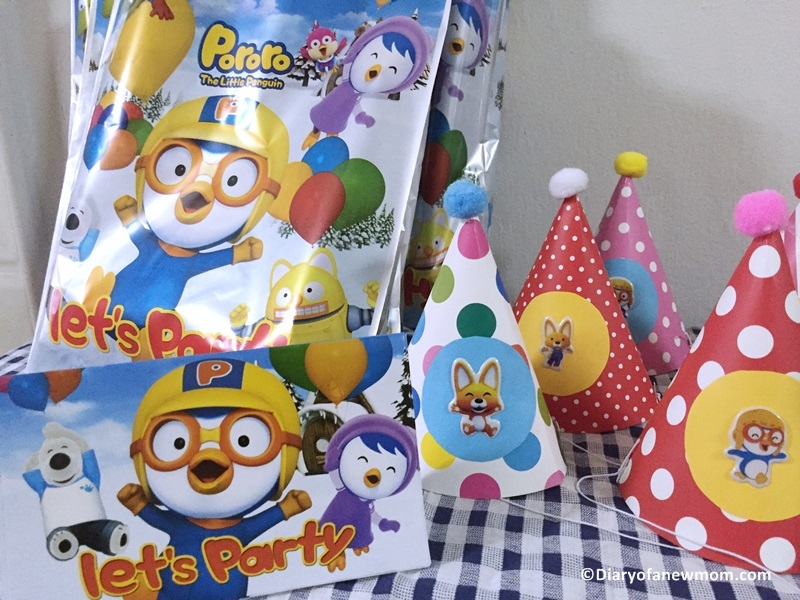 Using Pororo and friends stickers, I personalized those party hats to match the party theme. Here are some of the moments from our Pororo Birthday party with my kids playgroup friends. A photo with his friends.I covered the little faces due to privacy. And a mommy son moment! 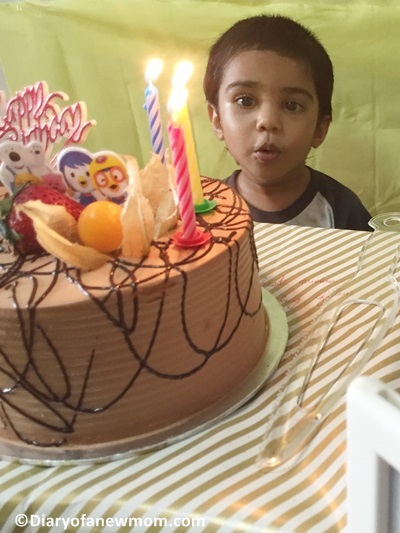 After the playgroup,we celebrated his birthday at home blowing candles and cutting this really simple cake. 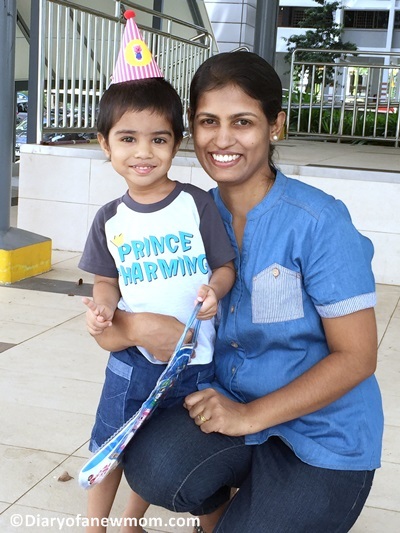 We had a great day with the kid.To make him happy,I also visited the Pororo Park with him.So he was full of activities with Pororo and the friends.It was a birthday party which created memories for him with his favourite cartoon character! This time I created his 3rd Birthday party album with Zno photo books. 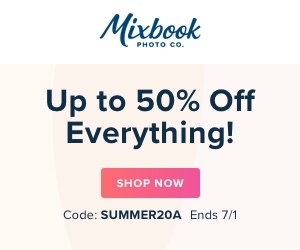 Mixbook is my other favourite company for his photo books. 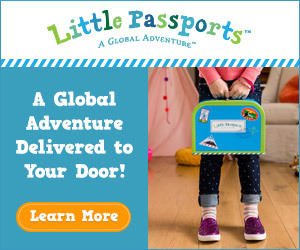 Do you like birthday parties?Do you throw birthday parties with a theme? Last week we visited the public library. It was the first library visit of our son, so he was really excited with his new experience. At home we encourage him to read books and we always surround him with books that are good for toddlers. When he was few months old, we introduced him some baby storytime books too. However, we bought most of these books for him. 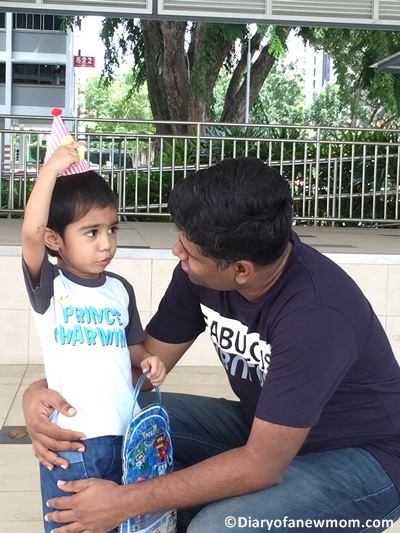 Recently he received new books from Josh & Cherrie subscription box service and Toddle.sg .So he has enough new books to read at home and he loves reading books. Ready to go to the library.He loves the bags received from Itsmybag.sg and wanted to use one of the bags for this visit. 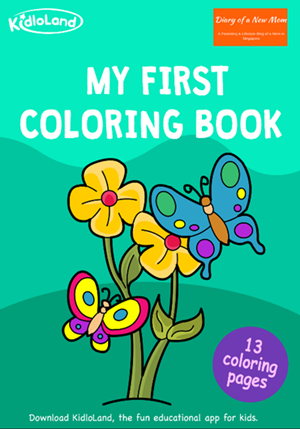 He also receives one book from his Playgroup library and he has some idea that he needs to return the library book after reading. Although I planned to visit the library with him from long time, it was always postponed. And finally we did it! When we visited the Kids World Fair last week, we also received some brochures and a book from National Library Board Singapore which encourages young kids to read. That made us really wanting to visit the nearby library. I always had doubt of my son’s behavior inside the library. As this is the first visit and he is too active, I prepared him along the week for the library visit. I always mentioned him that he cannot talk loud, he needs to sit and read books and finally he needs to return the books which he borrows from the library. Inside the library.He read many books. It seems the little guy absorbed the all things that we told him. He behaved really well inside the library. He was so quiet and excited with lots of books to read. Finally he borrowed few books from the library and these days our home is full of reading activities! We had a great first visit to the library! How about you? Do you visit the library with little kids? Do they like their library experience? Please share your thoughts below. Toys are essential for development of babies and toddlers. However, we as parents need to select the age appropriate toys to get the most of the benefits of play time. Toys can improve many skills for the little ones including imagination, creativity and hand eye coordination. However, as parents most of us always pay more attention to select educational toys or age appropriate toys which develop skills of infants and toddlers. Have you ever searched toys for your toddler considering any safety guidelines or do you always search for the best toys for toddlers? When it comes to the best toys for the toddlers, you may lack of considering some of the safe tips which you must follow. That is why it is always need to consider both safe and educational toys for the young kids in order to create safe environment for them. Specially, it is important to follow toy safety standards and toy safety tips with toddlers as they are in a curious stage of life which they always try to explore new things. Actually,I decided to write this post because of one of my experiences which I regretted much.Exactly one year ago(Last year September),my son faced an accident at home.He slipped on the floor and ended up with 4 stitches on his chin.If you notice the below picture which was taken at his 2nd year birthday celebration,he was with 4 stitches on his chin.In all these birthday photos he looks so tired because he was under treatment.Actually the floor was clean and tidy.But I gave him a balloon and the excited kid wanted to grab it fast and slipped on the floor.It was an accident which we never expected. Today,exactly after one year of that incident,I want to share some tips which you need to follow when you buy toys for your toddler or when you play with your toddler.These may helpful for you to avoid some of the unexpected incidents which we don’t want to face in our life. Here are the tips which you can follow in order to ensure that your toddler is using safe toys and games. These tips will ensure your toddler to play in a fun and injury free environment which also creates a peaceful mind for you. Check for age appropriate toys and games. When you buy toys for your toddler, always check the product description and appropriate age range. This will ensure that you buy the correct toys for his age. Once you open the packaging, always remember to discard the plastic wrappings. Plastic wrapping can suffocate a small child creating hazards that you will never expect! Always avoid small toys and games from young children which increase possible choking hazards. Toys with removable small parts always increase the choking hazards. I always pay attention when he plays with small toys. Strangling is another possible hazard which you should aware of. If the toys are with rope, string or cords, you must be careful when your toddler is playing with such toys. It is always better to keep the strings away from their reach. This trace & lace set comes with few cords.Instead of avoiding him playing with such educational toys,I always keep my eyes when he plays. Always inspect toys of your toddler for sharp edges and broken parts. Discard the toys if those are broken. Keep the toys in designated areas after playing. Start doing so with your toddler. Not only he will learn organizing from the early days of his life, he will also love this activity after any play session. Your toddler will have safe environment with tidy floor which also prevent falls and such accidents. 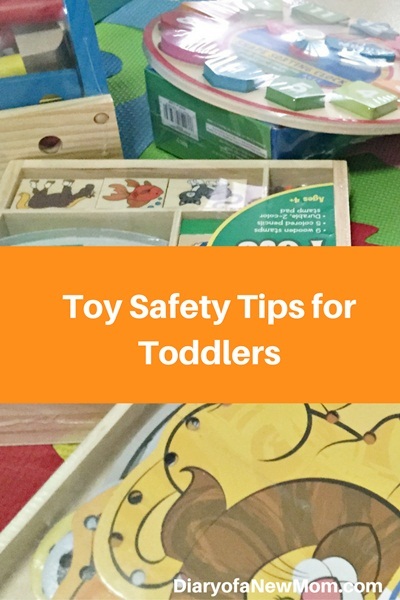 Not only with toys, you also need to follow safety guidelines and safety tips in everything you do with your toddlers and infants. It can be Food, outdoor playing, baby furniture or even travelling.You can easily learn more at Kokopax’s website about safe baby products and how do we need to decide on the products before buying.Safety should be in first concern with everything you do while raising your kid in order to raise happy and healthy kids. Other than safety guidelines, it is also essential to know the latest information on recalls. Recently I came across of Consumersafety.org which focuses on consumer safety. Their mission is to make information about recalls and safety-related news about drugs, medical devices, food, and consumer products with easy accessible way to everyone. Actually I opened my eyes once I read their safety guidelines and tips for infant & kids. There are lots more informative details and guidelines which you can read at their site. 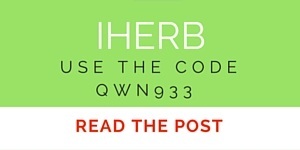 Have a look and see how you can add the safety guidelines and recalls information for your lifestyle. You can also find the alerts for recalls which are really helpful for you in order to keep your home and loved ones in safe environment. Do you consider safety tips when you buy toys for your kids and toddlers? What are your toy safety tips? Please share your ideas below. It is time to explore the things around! We spent more time on playgrounds and we found new activities rather than just playing. We also spent time on playgrounds at night watching the sky.He always loves exploring insects and things around him. Is it an insect on this leaf? He found this slide as a good place to read a book. 🙂 At that time there were no other kids at the playground. How was your week? Do you have any photo stories for this week? Please share below. We observed the phases of the moon! Last few weeks my son showed interest on planets and the moon. He watched some planet songs for kids from YouTube and started asking questions. He was full of curiosity. So, I decided to show him the Moon and the phases.Instead of having indoor activities to give him the idea of phases of the Moon,our nights out were really a good and fun way to explore the changes of the sky and the Moon! During the last weeks we went out every day at night. It was really fun and a new experience for him. We visited a nearby playground which stretches over a spacious land area. Although it was night time, the kids’ playground and the adjacent elders’ exercise area was really active with people from around the neighborhood area. So, we stayed there few hours watching sky and playing. Having a drink while watching around.It was a great experience for him! We watched sky and some days were full of clouds. There were days we could watch stars. His main attraction was watching the moon.As always he also didn’t forget to play at the playground. Playground was with few kids.So,he could easily play as he wanted. Some days,he liked to read a book at the playground.He could read books because it was not crowded with kids as it was night time. Reading a book at night and at the playground is a really good idea! We started our night out with crescent shaped moon and yesterday it was almost a circle. (Near to Full Moon) My son who is still a toddler loved his new night time experience. He enjoyed watching moon and changes of the moon shape day by day. I was with phone camera,so the captures of the moon are not clear enough to share in this blog post.But,below is a capture from yesterday which it was almost Full Moon! Finally,it is almost Full Moon! I guess as a toddler, this idea of moon phases from crescent shape to a round shape is good enough to learn bit about the sky, space and stars. He had good time and was not bored! I also had great time watching phases of the moon with my toddler. Please share your ideas and experiences. These are some photos which I captured in end of 2015 during our Sri Lanka holiday. Our son was exactly 2 years old at that time and we were in a shopping mall. He suddenly found this mirror in the fitting rooms’ area and started exploring and experimenting. As the shop was not crowded and as he was seriously experimenting the reflections through the mirror, I didn’t bother of taking him out. Instead I used the opportunity to allow him to learn, explore and experiment. Playing with mirrors is one of the popular toddler activities which help them to boost different skills. Some of the benefits of playing with mirrors include focusing and identifying their image. A mirror may help developing social skills at the same time emotional development. I also found in another post that a mirror can boost the development of brain of a toddler or a baby as they try to explore and experiment different reflections. Do you have any photo story to share? Please link below. Do you allow mirrors to your kids for playing? Please share your thoughts. Among the toddler activities we do at our home, bowling with empty bottles is a pretty simple activity to keep a toddler cheerful! Recently we got the semester progress report from our son’s playgroup and I found there are many activities they do at the playgroup to improve toddler skills. Among many activities that our son performs well, there was one activity which had the remark saying ‘sometimes’. It was throwing a small object to aimed direction. Although it is not a big problem for us because he does throwing objects sometimes only, I just thought of creating some activities for him to do at home to improve his skills. With that in mind, I came up with this idea of throwing a ball to empty bottles. I think this is pretty good to add to the toddler activities list. It was a great hit to keep our son active, cheerful and concentrate at the same time. He loved throwing balls to the line of bottles and he wanted to see when all the bottles fell down because of him. Among the activities for toddlers we tried before, throwing a ball to empty bottles was great and kept him moving and shouting! Here is what we did. It is pretty simple. We need few empty bottles for this activity. I found some similar size empty bottles from our DIY recycle bin. We then arranged all the empty bottles in a row. For this activity we used few different sized balls, so we could also talk about balls using the terms such as ‘small, big and colours such as green, yellow etc. Once we arranged the empty bottles, then we stayed around 4 feet away from the bottles. I asked him to throw the balls to empty bottles. That is really simple and we could spend around an hour playing this game. 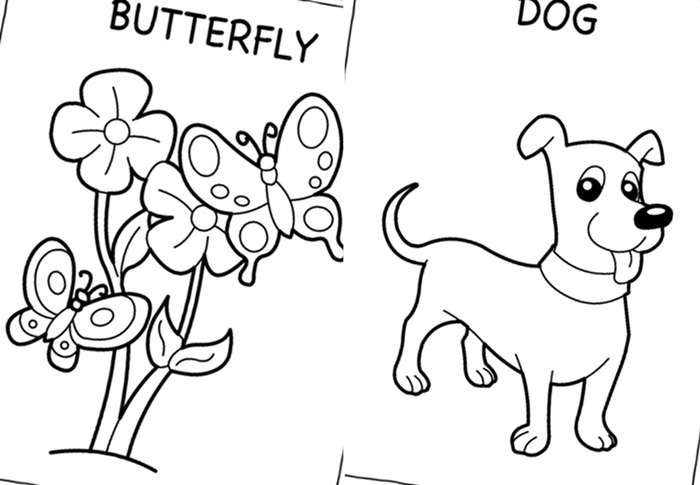 Check some other activities for toddlers which we spent hours with cheerful play. Finger family nursery song is a very popular song which also makes it fun for little ones to learn new words and activities. My son watches these songs in YouTube videos and kids Apps, so he is always active with a song in his mind. Here I am. Here I am. How do you do? Mommy finger, mommy finger where are you? That is part of the original song. But instead of Daddy, mommy we found songs with animal characters too. Such as fish finger, monkey finger and so on. As my son loves this song much, once we bought him finger Muppets to play. Later I found really easy idea to make him finger Muppets with different characters. Here is one of such ideas. Making fish finger family is really easy and it only takes few minutes. Take one sticker and attach a straw behind the sticker using a piece of sellotape. Continue same for the five stickers. Now sing the finger family song showing the daddy fish, mommy fish, brother fish, sister fish and baby fish. This is always a fun activity at our home. Use different character stickers and make different finger families. So, your toddler will not get bored when there is no activity to do! Actually, I couldn’t take photos leisurely as my son was dragging one by one when I finished making the fish family straws. He loves this activity each time!